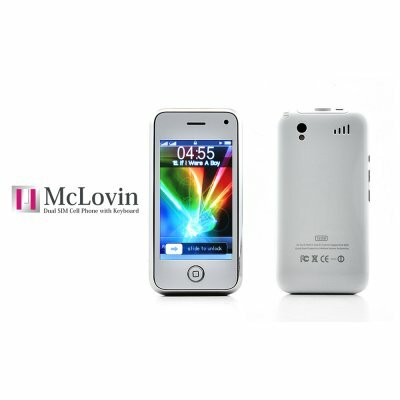 Successfully Added McLovin White Quadband Dual SIM China Cell Phone with Keyboard to your Shopping Cart. The McLovin, a china mobile phone that has everything today's power user demands from their cellphone including dual SIM, QWERTY keyboard, Bluetooth, large 3.2 inch touch display, unlocked, and works everywhere in the world - you will be McLovin it! Now available in beautiful, pure white! This tasty china mobile gives you one of the best user experiences you have ever had from a quad-band worldphone. Navigate icon menus using your finger like you would with an iPhone and then type messages and emails to your friends and colleagues using the sliding QWERTY keyboard just like on a Nokia N97. With 15 languages to choose from, you can be sending a text message to your friend in Paris saying "bon jour", a message to your cousin in St Petersburg saying "добрый день", and a message to your business associate in Sao Paulo saying "boa noite"
The McLovin embodies the functional core excellence of mobile communication demanded from today's high performance handy cell phones along with the extra media features today's power users like college students and mobile professionals prefer from their unlocked GSM cellphone. In practical terms, the McLovin is a China Mobile Phone that does everything the "name brand" phones does, but comes with a low China Wholesale Price. So if you are in the market for an unlocked, full-featured, worldphone for work or play, then the McLovin is the phone for you! As a matter of fact, if Harvey Dent owned a cell phone it would no doubt be the McLovin. Don't wait, order your samples today to see how good this China Mobile is for yourself. You and your customers are going to simply love the McLovin! Separate photo and ringtone for each caller on your contact list! Love the phone, want a different color? Try CVFD-M125! Voglio fare i complimenti a Chinavasion perchè in 3 e dico 3 giorni lavorativi ho ricevuto questo cellulare a casa mia. Il cellulare funziona benissimo,ha un buono schermo,è facilissimo da usare e ha un discreto volume. L'unico difetto che ho notato è che la tastiera è poco illuminata per tutte le altre cose è super consigliato anche la lingua Italiana che sembra quasi perfetta. What really impressed me with this phone is how fast it is. It will do circles around my BlackBerry Storm 9550. So far no problems, I put in my Verizon Wireless Sim and been in bizz ever since..